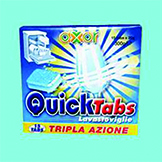 Detergent for dishwasher in tablets. Triple action. Code: TL 200. Packing: 15x20 gr tablets.